A few days ago I gave Scott, our chief engineer a lift down to the docks to pick up a new mobile pump - just rolled off the ferry from Germany. However beforehand there was a client nearby who needed a quick problem solved. 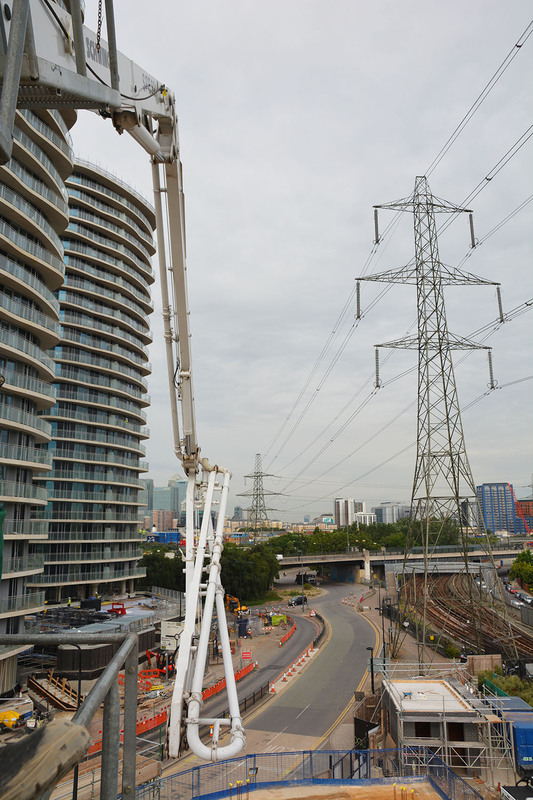 They were about to start using an SPB32 separate placing boom to place the concrete on a new development which was quite close to some high voltage power lines. Of course any metal (or earthed object) getting too close to these things is inviting serious trouble so they wanted us to restrict the slewing angle so the boom couldn't get too close to the lines. We climbed up the tower and Scott set to work and programmed the necessary restrictions and had tested the results in what was probably less than half an hour while I took a few shots from the platform. It was interesting to see an example of the variety of things our engineers are asked to do. It was also interesting (and quite affirming) to see how quickly and easily a Schwing Separate Placing Boom can be adjusted in this way.